Most of us really don’t live in reality. We live in a version of reality, a series of stories we have created. Reality = The facts of life’s events without any added meaning or judgment. Let’s take for example a natural disaster. It’s not a disaster, it’s an event. The ‘disaster’ part is our story about it. It’s our point of view, and a point of view is not reality. When you destroy a hornet’s nest, I’m sure you look at it as an event. I’m sure the hornets called it a disaster. Actually, they didn’t, because hornets don’t talk. They also don’t think or have human emotions, so they deal directly with reality. Their reality that day was simply that their hive was removed, and after defending it they moved on and they got busy building a new one. There wasn’t ‘massive loss of life’ and it wasn’t ‘an attack on their home’, or any of the other descriptive, emotional storytelling that we pile on top of reality. And they don’t hate you for it, because they can’t. So reality is like that, a simple series of events/occurrences, all due to specific causes that produce effects. Whether or not we understand them all is irrelevant. Life does not contain beauty…or horror or magic or injustice or hate or love. None of it. All of that exists only in us, specifically in our brains. That’s our perception, our story about life’s events and stimuli. In fact, it’s not much different than seeing color. Color doesn’t exist in the world. Color is a human perception. It’s the result of the stimulation of cone cells in the human eye by electromagnetic radiation. Our brain ‘sees’ that radiation as color, which enables us to gather information about our environment. Sorry. Now you know. It isn’t even black and white. Those are colors. The point being that we are looking at reality through a variety of thick lenses of perception. So are you really saying the world is void of love and beauty? I know you’re probably having a strong reaction to this. You think I must not be getting it. You are wrong, but that’s totally acceptable. You are being fooled by your brain. You are projecting your own thinking onto the reality in front of you. You’ve been doing it since you were born, so it’s fully ingrained by now. That’s why is very difficult to think of the world, of ‘reality’, in any different way. But the fact is simply that reality doesn’t contain human emotion. We add all of it. How could we not…we’re the humans! Why would it be such that the world contains human emotions and concepts, and we’re simply picking up on them? Doesn’t it make more sense that the humanity comes with the humans? How’s morality on Pluto? Love blooming on the Sun these days? Nah. Cuz there are no humans there. Those things are not ‘out there’. They are in here – something we add, just like color. And like color, we perceive (and feel) beauty, love, joy, excitement and fulfillment. And of course fear, disgust, anxiety, hatred, and so on. It feels like it’s out there in the world, but it’s not. It comes from within. We paint the world with those brilliant brushes. 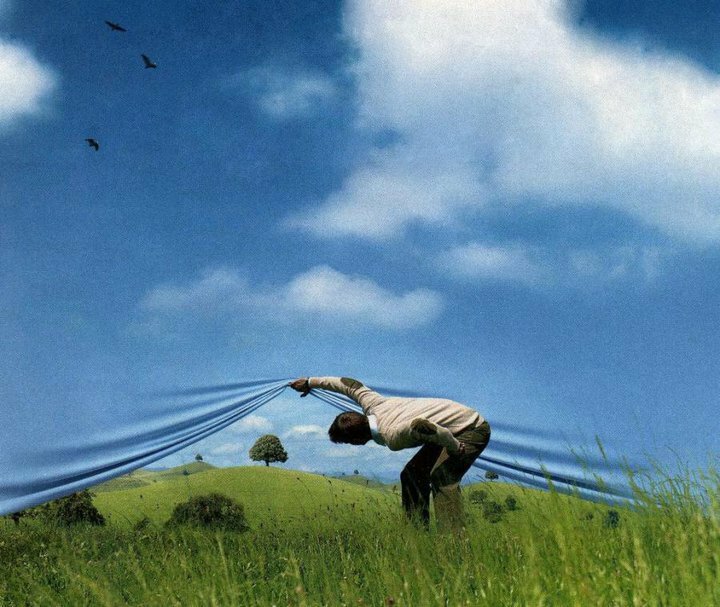 It’s simply our perception, added to reality. And that’s not sad. It’s amazing! How extraordinary we are as creatures to be able to scurry around on this rock in black frozen nothingness and find such amazing meaning and complexity to our existence. It’s remarkable, and it’s what we’re all about. But the key is to see that separation, to see the layer we add to life. It’s important to see a little daylight between reality and what we project on reality, because when we don’t…we’re in for all kinds of trouble. The trouble lies in the difference between reality and our story. Think of walking through a mine field with a bad map. Bad things are likely to happen. When your map, your story, is not a good match with reality, things happen that you didn’t account for and often are beyond your control. We call those ‘problems’, everything from minor annoyances to disaster. For example, your car is currently degrading. The process of oxidation is occurring at some rate, elastomers are drying out, and oils and other fluids are breaking down, even if you can’t see it. That is the reality. So if you don’t account for that in your story, eventually you’ll be headed for a problem. Given enough time, without addressing that reality, the vehicle will fail. And when that happens, it’s not someone punishing you, and it doesn’t mean you’re bad with cars. It also wasn’t “Murphy’s Law” or “just perfect, given how busy I am this week”. It will simply be a failed gasket. All the other stories we pile on top of that pretty predictable event are your own emotional storylines about it. And that’s where we can really get boxed in. When we start weaving these tales around our lives, what things mean, why this or that happened, whether this or that is ‘terrible’ or ‘justice’ or ‘perfect’, we are creating a fantasy world. And the more we do it, the more we reinforce that thinking and language, the more distant we get from reality. That generally leads to more problems, more surprises, and – frankly – the general sentiment that life is something that is happening to you, and you’re just along for the ride. What a fantasy line that is. What a surrender to delusion and emotion – at the expense of reason and clarity. How can we see it differently? As usual, there’s nothing magical about changing this. It’s a very minor shift in perception. In this case it’s simply to see the difference between your emotion (your story) and reality. For example, if you worked all afternoon on preparing a lovely dinner for guests, and at the last minute it slides off the counter onto the floor, that event is not any of these things: sad, unfortunate, frustrating, disappointing, defeating, embarrassing, a shame, etc. It is simply gravity, or perhaps a transfer of mass event. So why not approach it from that stance? Why does the story – the emotion – have to rush in and dominate the event? When we do allow that to happen, we really restrict our reactions and behaviors. You can see it as a minor event. You can smile about it. You can be happy, and calm. You can think about ways to turn it into a positive. You can come up with creative ways to solve the problem. You can learn from it. You can teach others about what not to do. You can choose not to quit, and find a way to make it happen regardless. We have so many amazing options when we deal with reality instead of running immediately to a story, and our emotions. We see this play out everywhere. When people are severely injured and accept it as their new reality, when problem-solvers get big things done in spite of the challenges, when people find creative ways to look at failures, and when certain people seem to be able to float along through life in calm control. They are dealing with reality, rather than a story. They are dealing with the facts, often referred to as ‘the cold, hard facts’. I find it funny that people refer to reality as cold or harsh. Truth and reality are – one would think – two pretty important concepts to align ourselves with, especially if we seek to live a happy, successful life. And yet when talked about in our culture, they are described as almost ‘bad’, a cold place that is uncomfortable. Hmm. Why would we want to use such off-putting language with something as honorable and important as reality, or truth? The only reason I can think of is that we’re afraid. It’s a lot more comfy to remain in our storyland, going about life with a thick added cushion of story and emotion. The problem is that it’s not reality, and it lacks the sharpness and clarity that comes from dealing with reality. It allows things to sneak up on us much more easily, and it keeps us limited to a series of set, emotional reactions to life’s events. I suppose it makes perfect sense. In comparison to the warm fuzzy world of storyland, of course anything else would seem hard-edged and cold. But that isn’t how reality is. That would just be another mis-perception. Dealing with life in a truthful, less emotionally-driven way brings a sense of harmony and control in life, control of self. Anything added to that – emotion and perception – then becomes a wonderful, deep addition to reality, not a way to mask it. In that way we can feel closer to life as it is, and experience all of the joys of humanity alongside, without getting the two confused.